The percentage of votes in favour was 66.4% with 33.6% against. Turnout across the country was 64.51%. The only constituency to vote “no” was Donegal with 51.87% against and 48.13% for, on a turnout of 57.96%. Taoiseach Leo Varadkar said the consensus included men and women and nearly all social classes and age groups. The question on the ballot asked citizens to opt to either retain or repeal the Eighth Amendment of the state’s constitution, which prohibits terminations unless a mother’s life is in danger. Pollsters suggested the stories of women forced to travel to the UK for terminations or take illegal pills obtained on the internet helped sway public opinion, as well as the death of an Indian dentist denied the procedure while she miscarried. Addressing thousands of cheering pro-choice supporters in the courtyard of Dublin Castle, Mr Varadkar said: “The people have spoken. They are saying this is a country where we trust women and respect their choices. Mr Varadkar said the results represented “the culmination of a quiet revolution”, one that had been taking place in Ireland for the past 10 to 20 years. The constitutional provision which prohibits abortion in all cases except where a mother’s life is endangered has been overturned. Taoiseach Leo Varadkar has said his Government aims to pass new laws by the end of the year. If, after 12 weeks, a woman’s life is threatened or there could be serious harm to her health, two doctors will consider whether to allow the procedure. So new laws are a certainty? The leader of the Opposition, Micheal Martin, has said his No-supporting Fianna Fail parliamentarians will not block the change. Those who campaigned against the measure have said they respect the democratic decision. The law will be subject to debate inside and outside the Dail parliament, and judging by the partisan nature of that before the referendum it could be passionate. There is likely to be renewed emphasis on crisis pregnancy prevention and care which has seen the number of cases dramatically decrease in Ireland in recent years. How does the proposed regime in Ireland compare with the UK? The UK is covered by the 1967 Abortion Act after a private member’s bill was brought by David Steel MP. Abortions can legally be performed if continuing with the pregnancy involves a greater risk to the mental or physical health of the woman than having a termination. An abortion must be agreed by two doctors and carried out by a doctor in a hospital or clinic. 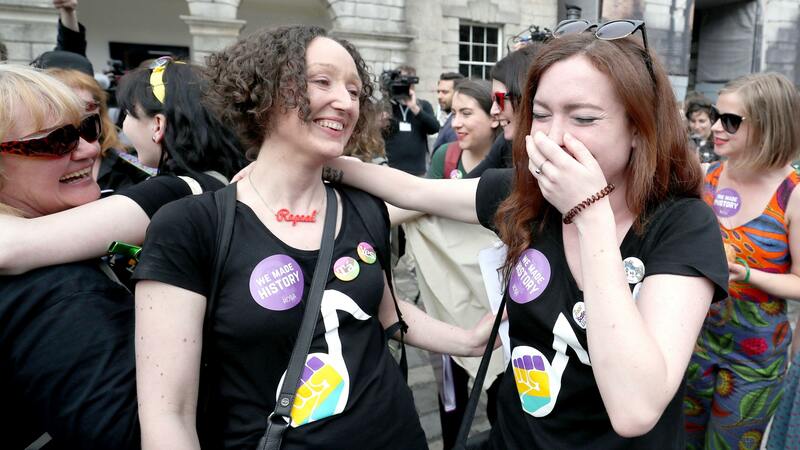 Is Ireland ready to provide abortions? The Irish Family Planning Association (IFPA) said it was committed to offering the procedures. Chief executive Niall Behan said it would support women with crisis pregnancies through whatever decision they make. “The Yes vote places the imperative squarely on the Government to ensure that the legislation is enacted and services put in place without delay,” he said.